Believe it or not, these swanky photos show the interior of a (luxury) motor coach. Beautiful, isn’t it? It was designed for the cosmetics brand Artistry as a salon showcase on wheels. Inside, there’s space for lounging, refreshments, product displays, and demonstrations. Outside, there’s purple under-glow lighting, a massive awning, a full graphics wrap, and a TV. This project is one of many unique masterpieces designed by Creative Mobile Interiors (CMI). We are proud that some of our light fixtures have made their way into CMI-designed coaches! You can see our T5 Microfluorescent Low-Profile Light Fixtures in action below in the left photo, illuminating the glass display case. We have a customer with a 1980’s motor coach that we have worked on several times over the years. It’s a retro-themed MCI coach that has the customer written all over it – especially on the 30-foot by 8-foot roof deck we built on top! The roof deck is accessed through a roof hatch and features (locking) flip-up handrails, surround sound, two operable pontoon boat tops, a dry box that houses a 360 degree swivel TV (32” LED)… and best of all, with the flip of a switch, water mists from the hand rails to cool those atop this one-of-a-kind party bus! The other vehicle is a 28-foot cargo trailer that we converted into a mobile ministry. The interior features a small kitchen, bathroom, and plenty of lounge/dining space for the troubled teens it will serve. The atmosphere is designed to mimic a cozy coffee-house where kids would want to kick back for awhile. The coolest feature of this trailer is the “second floor” loft that we built to supply more lounge/conversation space. To put a cherry on top, we custom fabricated floating stairs off of the wall to make access to the loft easy, and cool! To see more photos of Creative Mobile Interiors’ incredible work, check out their Facebook page. 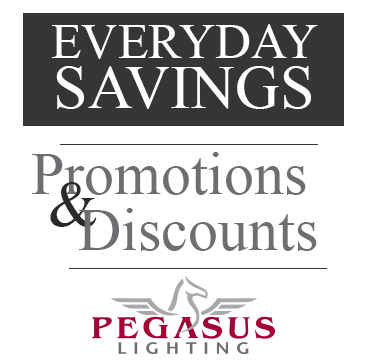 *If you’re a customer who would like to have your company/lighting project featured here, email me: professionals[at]pegasuslighting[dot]com. Has Congress Put the Stop Sign on Incandescent Legislation?